During May I decided to make a physical card game for the One Game A Month challenge. Specifically I wanted to make a game that incorporates the totally sweet drafting mechanic. 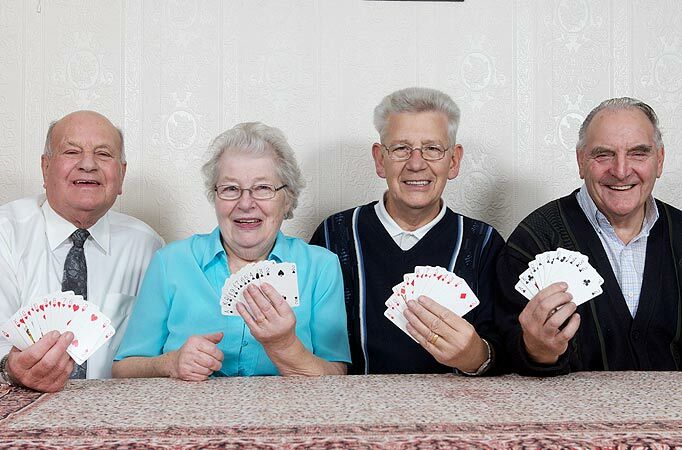 Drafting is where you deal each player a hand of cards and they pick one to keep and then pass the rest onto their neighbour, repeating til no cards are left. Why are we all sitting in a row anyway? As a mechanic it is both easy to grasp and strategically deep – as you become more familiar with the game you are drafting for you start to not only draft to get cards you want, but also to pick cards that you don't want your neighbours getting once you pass on your remaining cards. 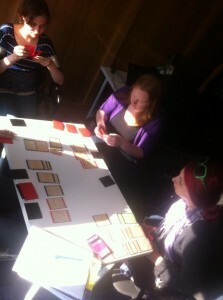 It's no wonder that such fantastic games as Ascension, Dominion and 7 Wonders all use drafting as a base. Read on to find out how I fared! 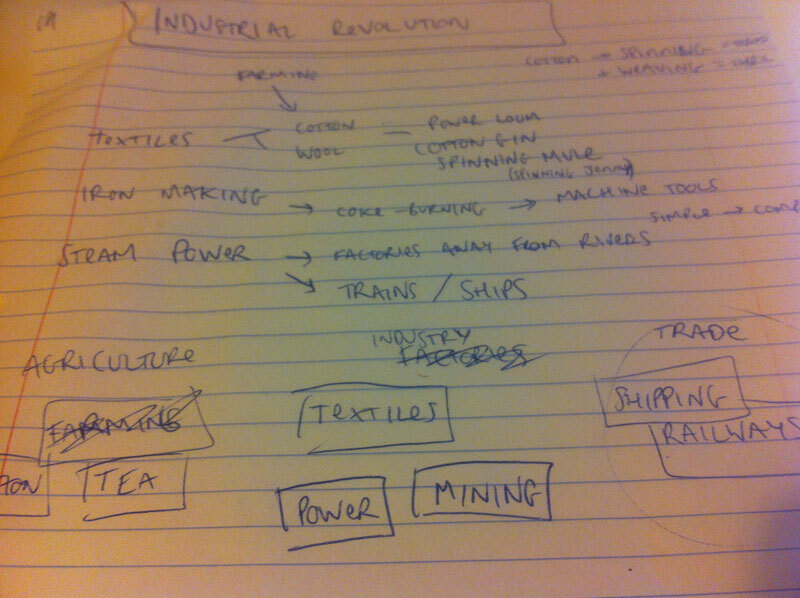 Some interesting facets of the Industrial Revolution..
My initial thoughts were to make a game where you alternate between drafting to get cards and playing the cards to expand your empire. I could have cards that represented some of the ideas pictured above, with the overall goal being to get the best trade empire by the end of the game. 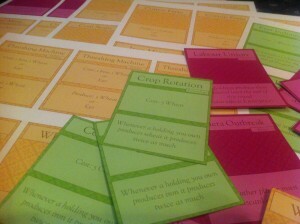 I started thinking along the lines of having both basic resource cards and more complex ones that were more powerful but needed prerequisites to be able to play them – so that early in the game you would be torn between choosing the basics to get you started or choosing the super cards that you wanted to be able to play later on. 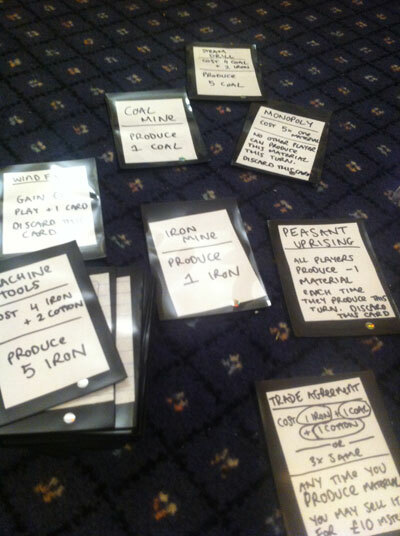 With a rich theme in hand and ideas for cards a-plenty it was time to build the first playable prototype. This by the way is the absolute best thing about building a physical game – it is just so easy to prototype. All you need is pen & paper plus some card sleeves (€6 got me 100 sleeves from a local comic book shop). This part is far faster than coding up a computer game prototype! The pen (and card protector sleeve) is mightier than the .. um.. Very soon I had a playable game! 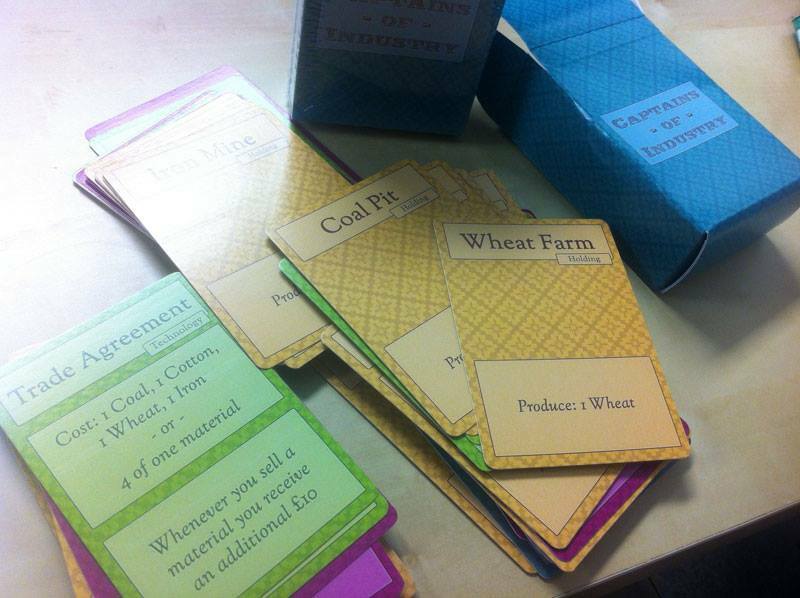 I had cards that produced basic materials (initially cotton, coal or iron), cards that doubled your output, cards that doubled your sale price for materials, and cards that messed with your opponent's play. Even at this incredibly early stage I was able to play the game and get a sense of how it was coming together – and already there was the makings of a fun game! Here you can see the three types of card you could draft and build: Holdings (which produce materials), Events (which have a one off effect and are then discarded), and Technologies (which give you alone some sort of permanent upgrade). 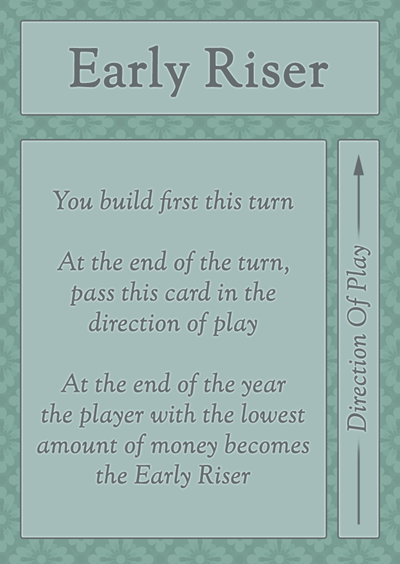 As I worked through the nice-looking prototype stage I was also reworking the rules of the paper prototype, which was an easy side effect of having to type up each card as I created it. At this point I also added a fourth material type (Wheat) to round out the production side of the game. 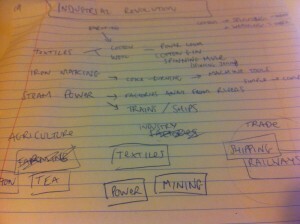 I also settled on a name for the game: Captains of Industry. Card Sleeves. Seriously just get some! 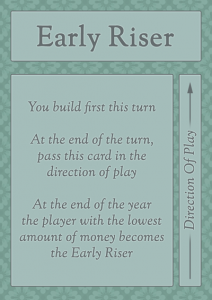 Now I could print and cut up a nicer looking prototype – reusing those all important card sleeves – and I was ready to get some people playing the game. At this point I'd say I had spent about 4 evenings total on this (far less effort than my previous month's flash game Dungeon Delver for example). This is starting to look professional! Another massive advantage of building a physical game is that most of the key rules simply exist in your head. Tweaking things that only exist in your head is really, really easy. Every time I was able to get 2-4 players together to play out the game I was able to tweak rules to make things simpler or better, often between games! The power of not having to code rule changes is extreme. This is why even computer game designers often make a paper prototype first! And when I wanted to change the cards themselves, I could do it with some self adhesive labels and a pen. Nice. 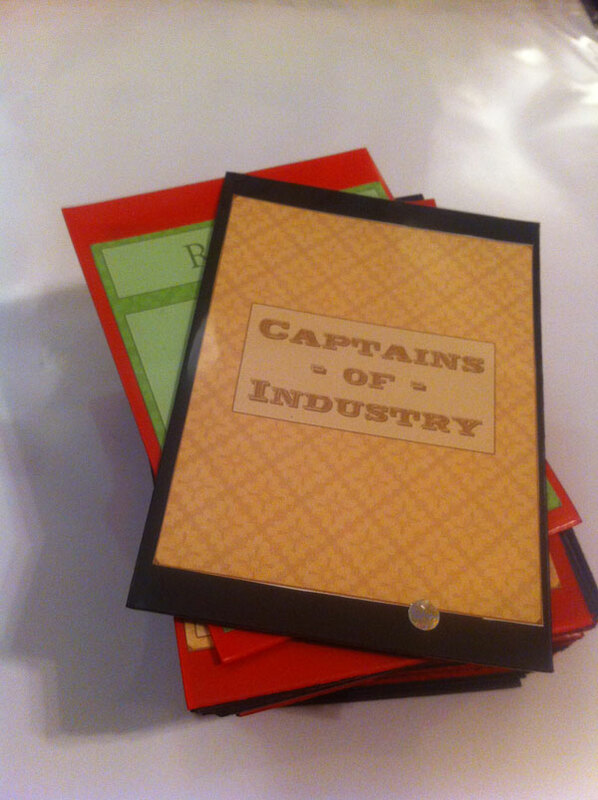 I brought the prototype of Captains of Industry to the monthly 1GAM Dublin meetup, and then to a similar event called dubLUDO which is all about showcasing your in-development game. I even forced coworkers and family to try it out! And every time I was watching like a hawk for ways to make it simpler to grasp, or richer in depth, and incorporating them into the prototype. Now it was time to get a proper professionally printed set of cards. I went back to my design templates and reworked them with all the rule & card tweaks I had incorporated into the sleeved prototype. When this was done I then uploaded my card art to a print-on-demand service called The Game Crafter and ordered myself a couple of copies of the game. Once these arrive I will be looking into doing a proper print run of the game. Get in touch or leave a comment if you are interested in getting your own copy of Captains of Industry! Edit: The profesionally printed cards arrived.. looking good! This Site is very essential for me. Because I have got many information from here.Thank You ……….